Sally's had a sale going on last weekend. I needed more polish remover so I convinced the husband to stop on our way home. I also knew that there was a promotion for Seche Vite. If you bought a bottle, you got a bottle of China Glaze polish for free! I have been having no luck with Poshe lately, so I decided to go back to SV. I can't do non-fast-dry topcoats. I do my nails after the kids go to bed, and I don't really want to be up until dawn waiting for my nails to dry. In addition to the SV and the 128oz bottle of remover (it was $20! 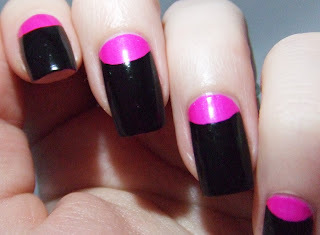 ), I grabbed a neon pinky-purply color that I had been eyeing since before Christmas. I used those little circle reinforcers to make this happen. I love the look, but hot-damn they are hard to line up. I put a layer of SV on top of the Purple Panic, and I am glad I did. This allowed me to go back in with my clean-up brush and remover and straighten out the arcs. Otherwise I might have given up all together. please forgive the tipwear and scuffs. I didn't get around to taking photos for about 3 days. In that time, I took my Christmas tree and decor down and moved a giant entertainment center that I bought on Craigslist. Gotta love SV, I don't think anything else would have stood up to the abuse. Pink and black always look great together! it's hard to go wrong with these colors, I must agree! Stunning! Well done on getting them so even.